Having Trouble with the ACAP App? Our mobile app runs on both the Android and iOS (Apple) platforms. We release updates to the app on occasion to fix bugs, improve functionality and introduce and introduce new features. Because our app runs on a multitude of devices, new releases can sometimes have problems. See our most Frequently Asked Questions (F.A.Q.s) below. 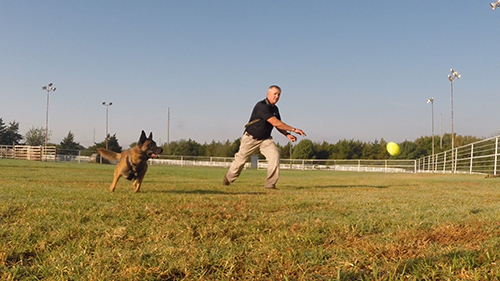 Do I have to have a police dog to do the ACAP? What is the difference between Basic and Premium versions of the App? The Basic version and Premium version both will start on the same path but will separate over time. From that point the basic version of the App will provide you with a low intensity workout for your dog that will help them achieve a moderate level of fitness. The Premium version will provide you a higher intensity training regimen that will provide a higher level of fitness for your dog. Because attaining a higher level of fitness mandates a greater understanding of canine exercise physiology, the Premium version also includes a more robust educational section that includes tutorials and reference material that will help you understand how to get the most from your dog and his training. Are the workout exercises safe for all dogs? The workout exercises are safe for dogs in good health and soundness, and do not suffer from diseases (including obesity). 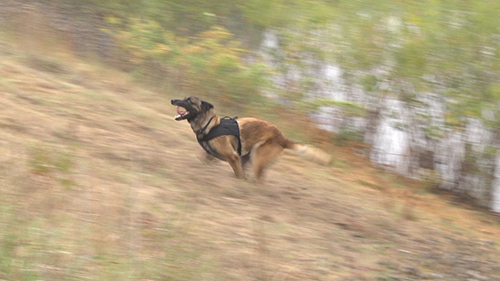 Like any effective exercise conditioning program, the exercises are intended to produce mild-to-moderate stress to stimulate the dog’s body to increase conditioning, and therefore there is some degree of risk if the exercises are not conducted properly or the dog is not sufficiently healthy to undergo physical training. If you have any questions as to whether your dog should participate in these exercises, you should consult with your veterinarian. Why can't I see my dog's entire planned workout schedule at once? Having a structured workout approach is critical. If an entire workout is listed, one may be tempted to jump ahead or skip certain exercises due to time factors. The ACAP is designed to be followed in a structured manner for optimal use and improvement as you progress. Can I revisit a past workout? You will be able to see notes if you choose to capture them on a specific exercise during that workout, but you will not be able to revisit an entire past workout. What should I do if I miss a scheduled workout? Everyone misses a workout once in awhile. Sometimes even two. A useful rule of thumb is to resume your workout if you’ve only missed a few days. If your workouts are interrupted for longer than that, it is prudent to start over since there is substantial loss of cardiovascular fitness. My dog loses interest before the workout is finished. What should I do? Losing interest is a sign that the exercise is no longer fun for the dog. While it is possible that he/she is getting bored, it can also stop being fun if the dog is excessively tired, injured, or otherwise uncomfortable. Carefully assess your dog to determine whether the lack of enjoyment is due to a physical problem (lame, excessive fatigue, overheating, dehydrated, over trained) or mental issue (boredom, frustration). Should I change my dog's diet when starting the workout program? A dog is going to burn more calories with this workout program, both due to the increased calories burned during the exercise as well as the increased metabolism that is used to adapt the dog and increase its fitness. There is no single answer for how much more to feed the dog due to the variable intensities of exercise throughout the workout. Weighing your dog regularly to make sure he/she is not losing weight is a simple, albeit crude, way of determining whether you need to feed the dog more or less. 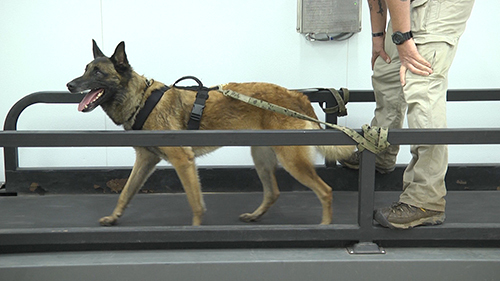 Learning how to evaluate the dog’s body condition score is a more accurate way of assessing whether the dog’s diet is adequate for the conditioning activities and goals. How soon after a meal can my dog do his/her workout? A dog doesn’t like working out on a full stomach any more than you do, so you should give the dog an hour or two after a meal (longer if it is a large meal) to avoid getting the meal back. Often, the best approach for managing meals around the workouts is to feed immediately after the dog has cooled down from a workout. Should I limit my dog's water consumption during or after the workout? Working out will increase the rate of water loss from the dog, potentially leading to dehydration and loss of the ability to effectively cool itself. Whenever possible, a dog should start the workout fully hydrated and be allowed to drink a moderate amount of water (up to 500 ml for a 25 kg dog) every 30 minutes or so during the workout. In the Premium version of the App, there are extensive tutorials describing how to estimate how much water your dog is actually losing (and therefore needs to replace) during various forms of exercise. What should I do if my dog appears to be lame during or after a workout? Lameness is always a sign of a problem. If a dog appears lame during exercise, the exercise should be stopped and the dog examined to determine the cause of the lameness. If the lameness is not something that can be readily resolved (like rocks in their booties or an ill-fitting harness), then the dog should be rested and re-evaluated after they are cooled down. Not every lame dog needs to be rushed to a veterinarian, but severe or persistent lameness should be evaluated. How can I tell if my dog is getting too hot? Look in the homework section of the App. Thermoregulation is a very important topic for any working dog, which is why we have included several tutorials in both versions of this App. I don't have access to water for swimming or my dog doesn't like to swim. What should I do? Swimming is used to stimulate the cardiovascular system as well as provide joint movement without loading. While no other exercise can exactly replace swimming, prolonged low intensity walking or jogging provides the best approximation. As a general rule, you should walk or jog approximately 5 times as long as you would swim for the same amount of cardiovascular and joint benefit. Where can I get the equipment that is required for the ACAP? The pull harness and weight carry bag devices are available at Guardian-Point.com. The weight sled, bungee and weights are available at sporting goods stores. The hanging bite pillow and sleeves are available from police canine equipment stores. How do I get my dog to carry the weighted carry device? 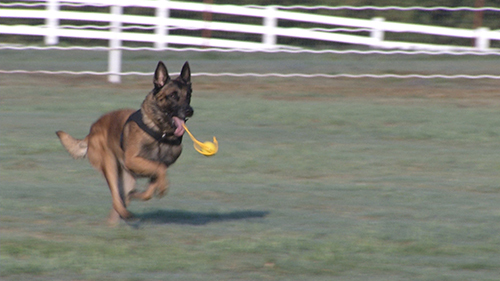 By using the device as a tug toy, the dog will become involved in the game of tug which can be transferred to short carry exercises. Short carries can then be progressed into exercise routines. How can I get my dog to jump up onto a platform or table? Start with small elevations and use a toy or treat rewards to get the dog up. Progress in height and always keep the game positive with toys or treats. I have never used a bite suit with my dog, is that a requirement? No, feel free to use what ever sleeve or other bite and hold device that you, your dog, and a helper are comfortable with. How old should my dog be before I start the ACAP? This varies depending on dog breed and size, but generally speaking, when growth plate closure is complete. A 15 month old dog typically has closed growth plates. If I login to my account from another device, does my subscription carry over? In some cases, yes. If you paid for a subscription to ACAP, you’ll have access to all content and functionality, not matter what device you log into the app from. However, users who pay for a subscription in iOS will not see their subscription or plan information in an Android device. The is true for Android subscribers; they will not see their plan information when logging into a device that runs iOS. What happens to my paid subscription if I change devices? If you are changing to a device that runs on the same platform (iOS or Android), your subscription will carry over, so long as you log into the device with the same user account (Apple/Android). If you are switching from one platform to another, you should cancel your subscription on your old device and purchase a new subscription on your new device to ensure you can effectively manage your subscription. You’ll still use the same ACAP username in either case. Not to worry, we’re standing by to address your issue and ensure your total satisfaction. To reach out to our development team directly, you can request support by clicking the button below and submitting a support reqeust. Need something else? To contact our customer support team, please call 1-800-830-6201.